The Rat Pack in Vegas, the days of the legendary Cave in Vancouver, and the general era of dine and dance Supper Clubs sparked the desire in Federico to re-introduce the concept of dinner, entertainment and dancing. And so, in 1999 he established ‘Federico’s Supper Club’ in Vancouver’s popular ‘Little Italy’ district; a restaurant offering authentic inspired Italian cuisine in an old school atmosphere, complete with entertainment, live music and dancing. The combination of his Italian heritage and an iconic era of music and yesteryear nostalgia today represents an award-winning business, which celebrated its 15th anniversary in 2014. Federico’s love for elements of yesteryear nostalgia and music, along with strong ties to his Italian culture and long line of family entertainers, are the basis of what motivates his desire to perform for audiences and recreate special moments. Taking the stage at an early age with his father, Federico was significantly influenced by an era of music that surrounded him growing up in the 60s and 70s: Dean Martin, Louis Prima, Tom Jones, and Elvis Presley are just examples of a period which represented the magic of more than just the music, but also everything affiliated with a lifestyle and philosophy of entertainment during that time. 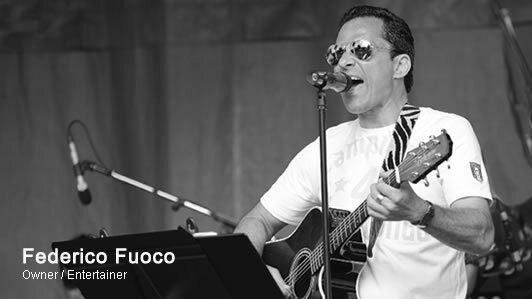 Feel good, make you want to dance, soulful and strong vocals are elements which to this day characterize the wide range of music in Federico’s repertoire: crooning standards, legendary pop favourites, Italian and latin. Crowned the ‘Knight of Clubs’ by the Globe and Mail, Federico offers music that has no age or cultural boundaries. Besides nightly performances at his Supper Club, Federico has headlined some of the largest charity events, including The Crystal and Diamond Balls, as well as the Michael Cuccione Foundation events. Since 2010, he has also been the headline act for ‘Italian Day’, one of the largest cultural street festivals in Vancouver, celebrating all that is Italian. Having opened for acts such as Umberto Tozzi, Albano and Romina Power and Massimo Ranieri - he is no stranger to the realm of Italian classics, pop and contemporary. In 2014, under his F2 Productions, Federico was successful in sharing Italian Rock & Blues superstar, Zucchero, with Vancouver fans by securing and presenting a Vancouver concert as part of Zucchero's Americana Tour. Later that same year in October, Italian legends Umberto Tozzi, Nicola Di Bari, Gigliola Cinquetti, Amedeo Minghi and I Cugini Di Campagna thrilled Vancouver in a group tour as Federico, for the 2nd time in 2014, was able to secure a concert in Vancouver as part of these artists' North American concert tour. His concert promotions then took off offering Italian celebrities Pupo and Ricchi e Poveri in 2015, showman and 70s icon Tony Orlando (2016), Canadian artist - Gino Vannelli (2017) and Italian legend, Massimo Ranieri in 2018. We are eagerly awaiting who is next for 2019! Actively involved as a Director of The Commercial Drive Business Association and overseeing the Drive's historic ‘Little Italy’ initiatives, as well as Past President for the Italian Day Festival Society, Federico aims to maintain the heritage of an area in which he grew up, performed and fondly recalls as a special gathering place for friends and family. Whether culturally or via the magic of music, Federico seeks to pay tribute to an era which represents what he considers to be..simply...the best.